The Albertine Rift is a long chain of mountains on either side of a rift valley in east-central Africa, stretching from southern Sudan in the north, straddling the Uganda-Congo border south to the southern end of Lake Tanganyika, where Tanzania, Zambia, and the Congo meet. The Rift forms part of the borders of five countries: Uganda, Democratic Republic of Congo, Rwanda, Burundi, and Tanzania. It reaches its highest elevations—5,109 meters (16,761 feet), with "permanent" (but quickly receding) ice caps—in the rugged Ruwenzori Mountains (the "Mountains of the Moon") on the Uganda-Congo border. It also contains some of the largest, deepest freshwater lakes in the world. 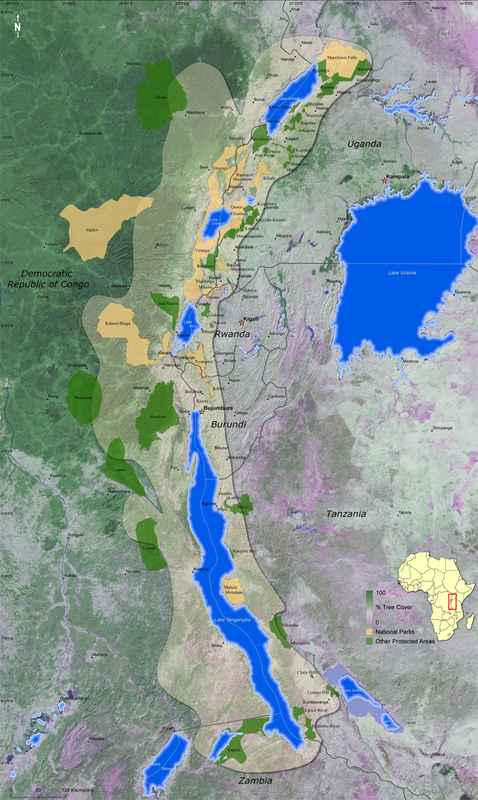 Click here for a protected areas map (WWF) and here for a relief map(WCS) of the Albertine Rift. Perhaps most famous for its population mountain gorillas (Gorilla beringei beringei), it is a region of extraordinary biodiversity. 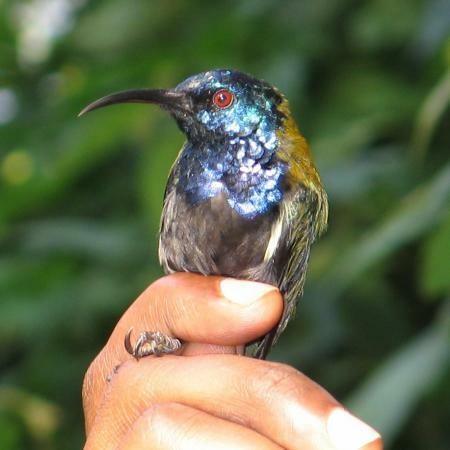 It is designated as Endemic Bird Area by Birdlife International, with over 40 species of birds that are found nowhere else in the world. 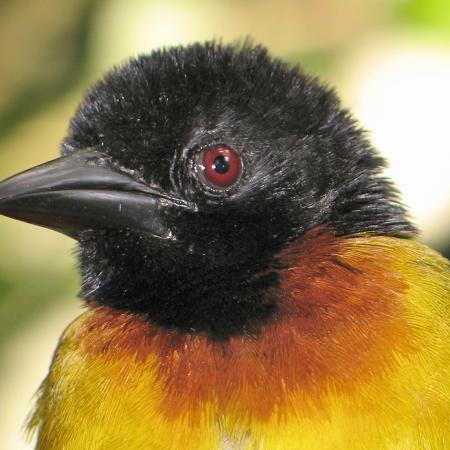 This includes species that are endangered and species that are very poorly known, including one described in 2010 based on FMNH field work—Willard’s Sooty Boubou (Laniarius willardi). It is also home to extraordinary small mammal diversity, including many recently described species and many others still awaiting formal scientific descriptions. The Albertine Rift was once nearly entirely forested, but has suffered from severe deforestation in recent years, particularly at altitudes below 2000m. 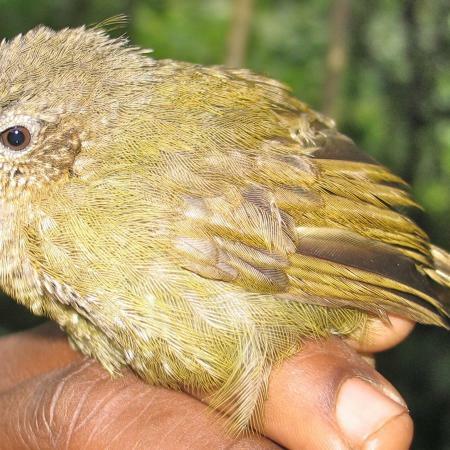 Part of the Field Museum’s research on genetic structure of birds in the Rift will help to identify areas that should be considered priorities for conservation by identifying areas with genetically distinct populations of birds and mammals. One of the most pressing conservation issues facing the globe today is global climate change. Little work has been conducted investigating the possible genetic effects of climate change. As the earth warms, species typical of lower elevations are able to colonize higher elevations to the detriment of higher elevation species which have nowhere to go. Recent work by the University of California Berkeley has shed light on this issue with respect to the mountains of California, but this needs to be investigated in montane region throughout the world. 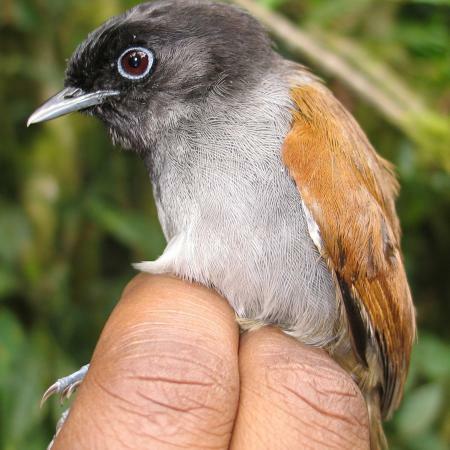 The Field Museum is currently trying to fill in this void by studying birds and small mammals in the Albertine Rift. For an excellent introduction to the biodiversity and to conservation issues in this region, see the Wildlife Conservation Society’s Albertine Rift website.